Tareq Alawneh and Chi Ching Chi and Ben Juurlink (2014). Proximity Coherence for Instruction Caches in Tiled CMP Architectures. Proc. 10th Int. Summer School on Advanced Computer Architecture and Compilation for High-Performance and Embedded Systems, Fiuggi, Italy (ACACES' 14). 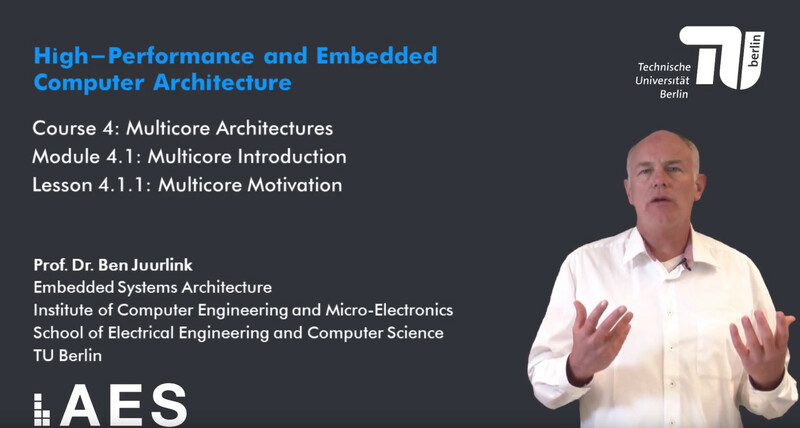 High Performance and Embedded Architecture and Compilation, 81-84. Chi Ching Chi and Mauricio Alvarez-Mesa and Ben Juurlink (2015). Low-Power High-Efficiency Video Decoding Using General-Purpose Processors. ACM Transaction on Architecture and Code Optimization. ACM, 56:1–56:25. Chi Ching Chi and Mauricio Alvarez-Mesa and Benjamin Bross and Ben Juurlink and Thomas Schierl (2015). SIMD Acceleration for HEVC Decoding. IEEE Transactions on Circuits and Systems for Video Technology, 841-855. Kristian Manthey and David Krutz and Ben Juurlink (2015). Reconfigurable architecture for real-time image compression on-board satellites. Journal of Applied Remote Sensing, 097497. Michael Andersch and Jan Lucas and Mauricio Alvarez-Mesa and Ben Juurlink (2015). On Latency in GPU Throughput Microarchitectures. Proc. IEEE Int. Symposium on Performance Analysis of Systems and Software (ISPASS), 169-170. Jan Lucas and Michael Andersch and Mauricio Alvarez-Mesa and Ben Juurlink (2015). Spatiotemporal SIMT and Scalarization for Improving GPU Efficiency. ACM Trans. Archit. Code Optim.. ACM, 32:1–32:26.